Copy These 21 Proven Long Drive Strategies And Add At Least 21 Yards To Your Drives In Just 21 Days… Guaranteed! How good would your life be…if you could consistently crush your drives AT LEAST 21 yards further than you are now? ….you stepped up on the first tee and SMACKED your drive 20, 30 or even 40 yards further than normal? See them now….scratching their heads and mouths wide open! And how much EASIER would golf be if you had 20, 30, or even 40 yards less into each and every hole? Would That Make Golf Easier? I know…adding 20, 30 or even 40 yards to your drives sounds too good to be true, right? But adding 1 – 10 yards to your drives in a day is possible right? Well, you just need to do that 21 times and you’ve added AT LEAST 21 yards to your drives….correct? Of course, adding 20, 30 or 40+ yards to your drives overnight is impossible. No doubt you’ve been let down many times in the past when you’ve tried things that have promised you distance gains. But adding 1 – 10 yards A DAY to your drives IS possible — if you know what to do. My name is Jeff Richmond and I’ve been in the golf industry for 26 years and helping golfers to improve for the last 13 years. Why Will I Help You To Add 20, 30, 40+ Yards To Your Drives When Others Have Failed To Do So? I don’t like to toot my own horn but I’m well known around the world for….helping golfers to hit the ball MUCH FURTHER than anyone else has ever shown them. Was the Shortest Drivers, Now One of the Longest! …there’s one big problem golfers face when trying to add yards to their drives which is this…. What’s Actually Going To HELP YOU HIT THE BALL FURTHER And What’s Going To Waste Your Time? So often I see golfers out on the driving range doing things that are wasting their time. For example, the other day I just finished up a lesson at the range and I was watching a golfer working on his swing. He was swinging back to the top of his swing slowly and then he’d stop. Then he would turn his head to try and see the position of the club…and if it wasn’t right he would adjust to get it just “perfect” and then hit the ball. Shot after shot was just terrible. He was getting so FRUSTRATED after each shot and I felt sorry for the guy. So…I went over, introduced myself as a pro and asked him what he was trying to do. He told me that he was trying to get into a “loaded” position at the top. I asked him what he thought that drill would do for him and his simple reply was….”help me hit the ball further”. I then asked him where he got the idea to do that and he told me he saw it in a golf magazine. I laughed to myself but the sad fact was, this guy had NO CHANCE of adding ANY yards to his drives by doing what he was doing. ”I haven’t seen any good results in the last half an hour but I need to work on it some more”. If you’re working on something to hit the ball further and you don’t see VISIBLE results within 15 minutes then you won’t see results in 30 minutes, an hour, two hours etc., etc. It’s just not gonna happen….period! But with millions of tips, endless advice and countless gadgets — all claiming to help you hit your drives further…. …there’s no wonder golfers like you are CONFUSED and DAZED as to WHAT IS ACTUALLY GOING TO HELP! And it’s no wonder millions of golfers all over the world are wasting their time and money on driving ranges trying one thing after another to hit longer drives. FACT: If a golfer knows exactly what they need to do to add yards to their drives… IT CAN BE DONE IN JUST 15 MINUTES…without needing to go to the driving range. That’s why it’s critical you find out now exactly what it takes to add 20, 30 or even 40+ yards to your drives. The longer you wait, means the longer you’re missing out on the joy of hitting longer drives… and the compliments from your friends. You’re missing out on making golf EASIER and MORE FUN. If you knew what to do right now to add 1 – 10 yards to your drives — you would go and do it, wouldn’t you? I would just give you some SIMPLE INSTRUCTIONS and off you’d go to practice. You’d then gain some yards quickly and easily. In fact, if I got you to work on your weak area…you could EASILY gain 10+ yards in just 15 minutes. So then all you need to do is rinse and repeat for 21 days. And by the end of the 21 day process you would have added AT LEAST 21 yards of distance to your drives – 100% Guaranteed. ….then they get confused and go around in circles and don’t add any distance to their drives. …what you need to do (AT HOME) so YOU can add 20, 30 or even 40+ yards to your drives. And I’ve called this new step-by-step program…. Every day of this new program you will…. …get one new drill or exercise that WILL add AT LEAST 1 – 10 yards to your drives in just 15 minutes per day. PLUS…ALL of the drills and exercises can be done in the comfort of your own home. So after just 21 days YOU WILL be hitting your drives AT LEAST 21 yards further than you are right now. And here’s just a fraction of what you’re going to be learning over the course of this 21 day program…. All long drivers have a WIDE swing arc. That’s why…on this day you’ll be given a simple drill that will FORCE you to swing wide — back and through! Your drives have no choice but to go longer after doing this drill. The better and harder you release through the ball the further the ball will go. On this day you’ll learn how to train a powerful release — WHILE SITTING DOWN! You’ve got to see this drill to believe it. And the results are remarkable! The more lag in your downswing the longer you will hit the ball. Lag is one BIG reason why you get little guys on tour (like 5 foot 9 Rory McIlroy) hitting 3 woods over 300 yards. On Day 15 you’ll get one drill that will FORCE you to increase lag in your downswing so you hit much longer shots. And if you fail with this drill you’ll get INSTANT feedback. Most golfers swing fastest at places other than right at impact. But to hit the golf ball as long as possible YOU MUST be swinging the fastest right at impact. That’s why on Day 19 of this program you’re given a drill that teaches you EXACTLY how to swing fastest right at impact. This is the best drill I’ve ever found to teach a golfer this KEY to longer drives. These daily drills and exercises have been arranged in a specific order so by the end you’ll get the most LONG DRIVE bang for your buck. Starting to add yards to your drives…in just 15 minutes from now. Then, in just 21 days from now hitting your drives 20, 30 or even 40+ yards further. How much easier are you going to find golf when you’re 20, 30, 40+ yards further up the fairway than you are normally. And with this program not only are you going to be hitting it longer than you ever have before, but you’re going to be hitting it straighter than ever before too. I’m sure it does — and you can start to add yards to your drives in less than 5 minutes from now. But it’s taken me years of pain staking trial and error to figure out what drills and exercises actually help golfers to hit the ball further. Plus, what specific order they need to be in. And if you came to see me to learn the stuff I teach in this program, it would cost you $75 for a half an hour lesson so I could teach you just a couple of these strategies seen as how they take 15 minutes each to do. So if you were to come to me IN PERSON for this 21 day program it would cost you…$787.50. But because this program is in digital format — that you can download at anytime and do at home, in your spare time obviously…I am able to offer it to you much cheaper than that. But even though it’s worth more than the price of a flash new driver e.g. $399.99, I’m not going to charge you that amount for it. Yes! You can add at least 21 yards to your drives in 21 days or less for just $37. ….help millions of golfers all over the world to add at least 21 yards to their drives. I know how heart breaking it is to try one thing after another and see no results. So I don’t want price to be a barrier to any golfer serious about adding 20, 30 or even 40+ yards to their drives to get this. But be warned — this is just an introductory price…the price will go up in the future to reflect the true market value. BUT right now if you click here quickly you can get this for just $37. If you come back tomorrow this program may very well be priced much higher. If you don’t add at least 21 yards to your drives after completing this program…or you’re not happy with it for any reason….just let me know and I’ll refund 100% of your purchase, no questions asked….anytime within 60 days of your purchase today. In other words, there is no risk on you whatsoever. Look, I’m taking all the risk…and all of the responsibility for you so…you’re free to focus on adding at least 21 yards to your drives in less than 21 days. Add 21 Yards to Your Drives for Just $37! You’re not going to add 20, 30 or 40+ yards to your drives with what you’ve tried in the past. It’s the same old story of doing the same thing, and expecting different results. Instead you’ve got to find out EXACTLY what you must do that WILL add yards to your drives….NOW! That’s what this 21 yards in 21 days program will do for you. 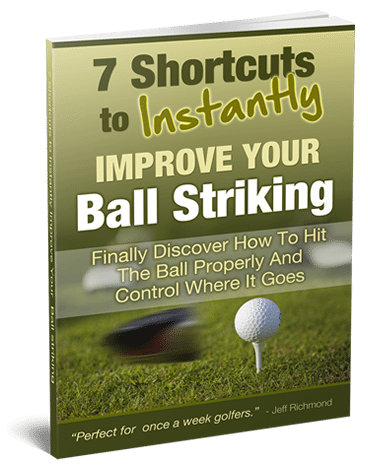 And it’s impossible to fail with this system….because no matter what, after completing it you will have added at least 21 yards to your drives or — you get your money back. At last, here’s a golf program that doesn’t require you to waste your time trying one thing after another in your quest for longer drives. Now you can just follow my simple drills and exercises, and reap the rewards out on the golf course. Clearly this is what you’ve been looking for all this time. …getting compliments from your playing partners on the distance you’re hitting your shots…. ….enjoying playing golf more because of the distance you’ve added to your drives. To Change With Your Golf Game? You’ll still be hitting the ball the same distance as you are now. And over time, you’ll get shorter and shorter as you get older. Listen. It doesn’t have to be like this. You deserve longer drives. It’s time to make a REAL change and add at least 21 yards to your drives in 21 days. This is your opportunity to do this, right here…right now. And to make this offer even more irresistible you’re also going to get…. When you get this 21 yards in 21 days program right now, I'm going to send you one extra drill via email every 3 days for 27 days - to ensure you gain way more than 21 yards in 21 days. 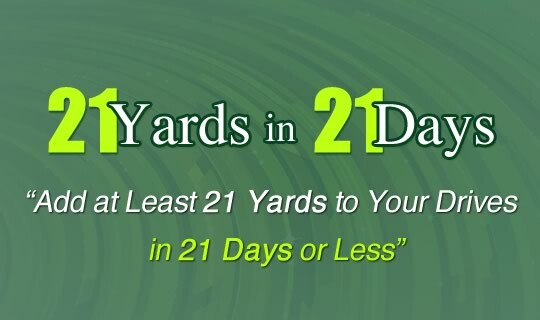 You see, everything in the 21 yards in 21 days program can be done at home. But these extra drills I will send you, are designed for you to use at the driving range. And…these drills will compliment what you’re doing to super-charge your results for even longer drives. It’s easy to make excuses, but deep down you and I both know that you really want this. You deserve to add 21 yards to your drives for a measly $37. And the alternative of going around in circles trying to hit the ball further doesn’t have to be an option for you anymore. 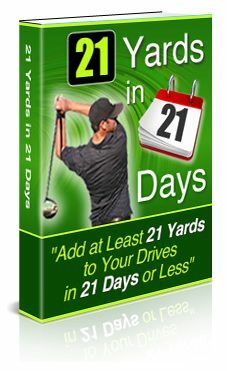 You can now add 20, 40 or even 40+ yards to your drives in 21 days or less. You can have your playing partners compliment you on your L-O-N-G-E-R drives. And you can ENJOY playing golf more and make golf EASIER for yourself. So the right time is NOW. Let’s add at least 21 yards to your drives in just 21 days. Click the Add To Cart button below to start right now. When you click the ‘Add To Cart’ button now you’ll be taken to PayPal’s secure payment page where you can pay for this. After PayPal has processed your payment, then click the ‘Return to Merchant’ link and you’ll be taken to a very special page, where you can immediately download the 21 yards in 21 days program. So go ahead….click the ‘Add to Cart’ button above to place your order and begin to add yards to your drives, and I’ll speak to you again in just a few minutes. P.S. Adding at least 21 yards to your drives in 21 days is 100% guaranteed. So to start adding yards to your drives right now simply, click the ‘Add to Cart’ button below and let’s do this! "This system has given me an extra 15 to 20 yards on my drives. I am also now more consistent. But the best thing is that the right side of the course is not one I dread anymore. Before this system my ball would go both to the right and left of the fairway. Now I’ve taken the right side out of play which is awesome and has given me a lot more confidence. One thing I really like about this system is it had a definite purpose with very clear instructions and great pictures and videos so I knew exactly what I should be doing each day. The daily format was great." © Jeff Richmond. All Rights Reserved.